Clean, comfortable accommodations in a friendly atmosphere. All stays include our famous "World's Best Breakfast"
In the winter season Friday, Saturday and Holiday stays include a great dinner! here - but you don't have to! 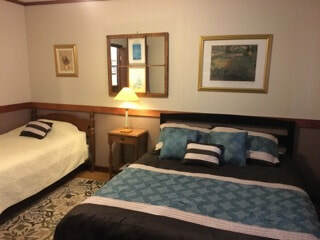 ​We offer a variety of rooms. 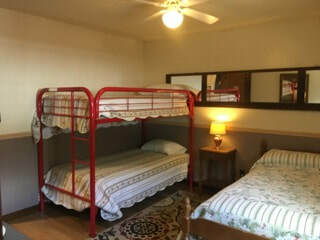 Rooms with a queen bed , bunk beds, two double beds or a double and a single bed are available. 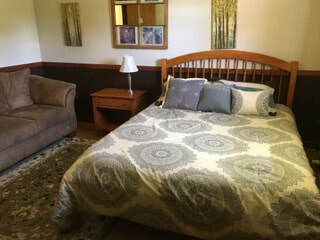 Each room is clean and comfortable and has a private bath. Children under 12 stay for just $10 extra! $20.00 per additional adult per night. $140.00* per room per night Double Occupancy during the winter. Children under 12 stay for just $10 extra! $35.00 per additional adult per night. Holiday week rates differ - please call for rates 1-800-245-5126. ****World Cup reservations still available!!!!! If you cancel your reservation you will be charged for a one night stay. Conveniently located at 4441 Route 100 in beautiful Pittsfield, Vermont. Your gateway to Killington and The Green Mountain National Forest, on the VAST trail system, and in the heart of the endless outdoor opportunities of Central Vermont.